Blow drying your dog correctly can be a daunting task, but when you’ve mastered it, it makes a big difference. 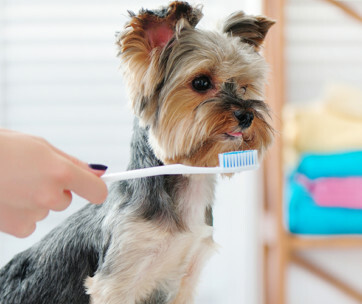 Keeping your dog well groomed is a fundamental aspect of pet care that not only keeps your canine friend looking good and smelling fresh, but that is also critical to his health and well-being. 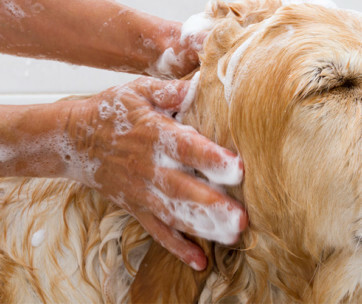 A clean pet is a happy pet, but that doesn’t mean the process is always an easy one. Bath time can be an uphill battle, and if your pet isn’t used to it, introducing unwelcome blasts of air from a loud dryer can act as an insult to injury. 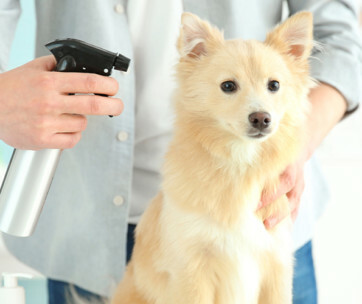 With our expert tips and guidance, we can help get you on the right track to blow drying your pup correctly from the comfort of your own home. 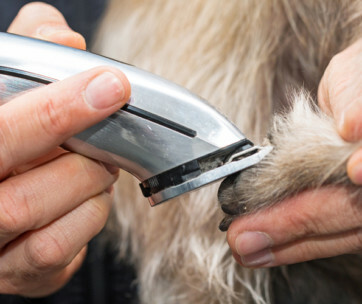 Before you even look at a hair dryer, it is vital that you towel dry your pup first. Towel drying can eliminate 70% of all of water held in the coat, and will ultimately reduce the amount of time you need to keep them calm and under a dryer. The golden rule of towel drying is not to do it in haste. Vigorously rubbing back and forth may cause knots and tangles, and this is the last thing you want amidst a grooming session. The best method is to drape a towel over your pet, and press and squeeze a section at the time. This won’t dry their coat entirely, but it is the best way to prepare them for a blow dry. 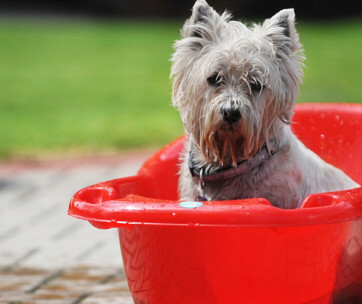 Be sure to brush your dog’s coat thoroughly before letting them take a dip, if you don’t, any mats will hold onto water and irritate the skin. Take time to research your dryer thoroughly and be sure it is appropriate for drying your pup: human hair dryers emit more heat, are louder and not always easy to hold while controlling your canine pal. Dog dryers are specially designed for an easy and comfortable experience for both owner and pup. Blow drying your dog is easy, blow drying your dog correctly is a completely different story. With patience and a little bit of luck, the process will get easier and you’ll be able to use the time to bond with your pooch. Before turning the dryer anywhere near your dog, test it on yourself. Dog-specific dryers don’t generate heat, but blast air at a high speed leaving the dog slightly damp. If your using your own hair dryer, switch it to the coldest setting and check the temperature throughout. Start as far back as you comfortably can, working in careful, circular motions. Start at the rear and work from your dogs legs, to his rump and tail. 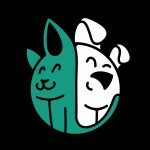 Workly slowly, seeing what they are able to accept and allowing your pet to get used to the noise and the air flow before putting it too close to them. Be patient and know that over time they will be happy to let you dry away. Don’t move the dryer any closer than six inches away from your pups skin. Continue with your circular motions on the areas of your pups skin, taking your time to ensure you don’t overlook any areas, but without linger on any one spot for long, as this will be uncomfortable for you dog. Dryers will move the hair while you work, and this is your best chance to check for any lumps, bumps or abnormalities. Most of these can be treated straight away if found at an early stage, so treat your blow dry as a health check at the same time! Work your fingers into the undercoat, massaging water away. Although not always easy, look at the water discharge, and try and be sure that you are blowing the water away from the skin rather than back into it. Be extremely careful around the face and ears. These are sensitive areas and both heat and air pressure should be reduced. When using the dryer around the ears, try to cover them with your fingers to reduce noise levels. Finish off by drying the back of your dogs head, patting his face dry with a small towel if needed. What Should I Do If My Dog Is Scared Of The Hair Dryer? It’s not unusual for dogs to be nervous or anxious at the sound of a hairdryer. Remember that Your canine pal is much more sensitive to noise than you are, and can hear sounds that you can’t even register. There are ways to ease the stress and make it a comfortable experience, and this starts with just being conscious of the sensitivity. Be ready with treats and praise throughout, making it an enjoyable experience for the two of you. Don’t shy away from taking short breaks or switching the hair dryer off to let them get familiar with it when it’s not so scary. It will take time, but it’s well worth it to make it an activity they can look forward to. 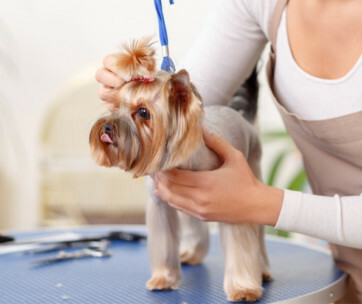 Don’t overdo it with the hair dryer – your pooch isn’t looking for a root lift or a bouncy blow-out. Drying their hair can leave it brittle, so it’s important not to blow dry coats completely. As a general rule of thumb, you should be able to run your fingers through their hair and still feel a slight dampness. Keep your pup indoors and let the natural air do the rest. Blow drying is one of the best ways to keep your pooch looking health and smelling fantastic. Although initially daunting, it is a vital part of grooming and can become one of the best ways to bond with your pet. With every bath, your dog will become familiar with the inevitable dryer and the process will get easier. Before long, you’ll be an expert in the art, and I can almost guarantee you’ll look forward to the chance to bond over a blow-dry with your canine friend.